This layout is very similar in design to the one I shared last time. I used a Pink Paislee paper for the background, Amy Tangerine cut aparts, and a branding strip across the center. The blue letter stickers are October Afternoon, and the pink are American Crafts Thickers that I have had forever. The stickers at the bottom are PinkFresh. I recently received twelve We Both Read books by Treasure Bay. These books feature a range of reading levels from PreK-2 and there are tons of titles to choose from-even books in Spanish. Each book provides an interactive formula ensuring parents aren’t just reading to a child, but the child is involved as well. 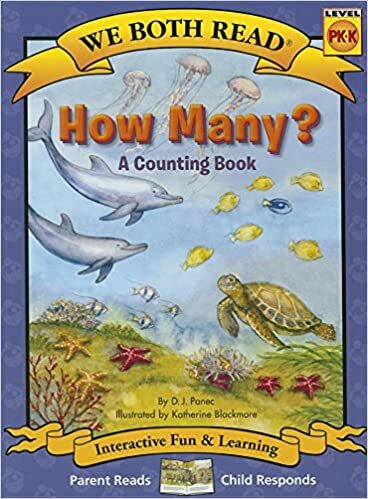 With the earliest books (PreK-K), the parent reads the book and then asks the child to answer questions about the pictures. At the next level (K), the parent reads one page and the child reads the other-usually just one or two simple words. The books progress to the parent reading a page, and the child reading a partial or completed sentence (K-1), and then finally (around Level 2), the parent and child are both reading entire pages, or the child can read the book alone. I really love these books. Honestly, I didn’t know that something like this even existed. I love that with such a wide variety in reading levels, these books work for every one of my kids-all at the same time! The earliest books pose tons of questions about the pictures throughout the story I can ask my two year old, and inspire me to ask even more questions as we go along. The pictures are large, detailed, and very colorful, which draw in his attention as well. I love the interactive nature of these books (not just me reading the story to him), and it is so wonderful to see him sharpening his observation and cognitive skills along the way. The PK-K books are perfect for my kindergartner. I read one side, and he reads one or two words on the other. We have read these stories several times already, and he chooses them each time we read. It feels like we are a team-completing the stories together-each with our part to play in reading each book. And, I cannot say how encouraging it has been to hear him say “I’m good at these” when we finish a book. Due to a learning disability, he can sometimes be easily frustrated, but these books have been so good at encouraging his self-esteem when it comes to reading because he KNOWS he is reading it and he is so proud of himself! Love it. I also really like that these books show the child’s reading part in bigger and bolder letters-making them easier to read. The upper level books are still meant to be read together by parent and child, but they don’t have to be. One of my favorite characteristics of these books is that I like how words that might be a bit more challenging are in bold type. The parent reads them first, and then the child reads them after hearing the parent read them first. This is great for reinforcement of more difficult words. As my nine year old daughter reads at a pretty high level, these are books she can just take and read for content, and they have some interesting topics-for instance-I don’t think I have seen the book about space since we received it. 🙂 I like that there are more fiction reads at this level such as Amazing Eggs and Endangered Animals-making them good resources for short homeschool writing assignments. All in all, I am very impressed with these books. They are perfect for multiple ages in a single family, or even if you want to start reading with a child at a young age and work your way up through the levels. They are really wonderful books for early/struggling readers too. I also love the interactive nature of these books and enjoy how much more fun reading is when BOTH parent and child get involved. I really want to thank Academics’ Choice for providing these books to me for my unbiased review-they are wonderful, and I am looking forward to picking up a few more for our collection! This week, we received a pretty fun toy to review-the Block Scooping Wagon by Mega Bloks. It is made by Fisher Price and is a wagon with a handle that kids can pull around. It came with twenty Mega Bloks, and even has a small platform built into the handle that can be used to create a tower of bricks. The toy is geared towards one to five year old kids, and my two and a half year old boy is in love with it. In fact, it was quite difficult to even get it away from him for the first few days to check it out for ourselves! I really like the fact that the wagon is maneuverable, and can turn around tight corners easily. We tested its ability to pick up blocks on tile, as well as thin and thick carpet, and it picks them up easily. We even threw in a few of our larger generic plastic blocks, and it picked those up as well. It is light, which is very nice as my son easily carries it up and down our four flights of stairs. I can also attest to its durability, as I found my son sitting in it a couple of times! The colors are bright and cheerful, and it is fun to hear the satisfying popping sound as blocks are successfully picked up. 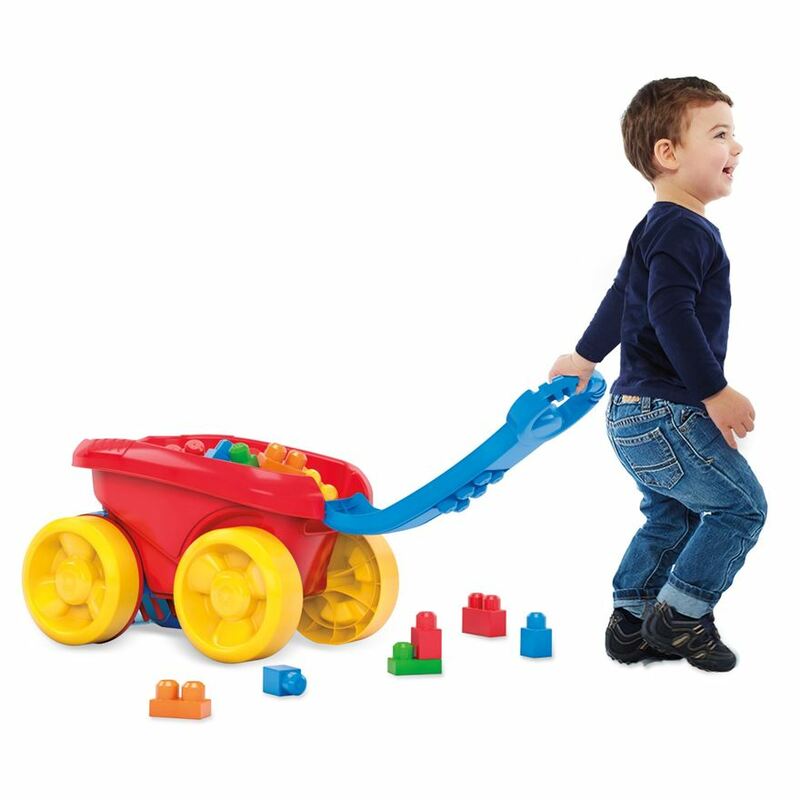 I would say the only downside to this toy is that while any child can pull the handle and use this toy as a wagon, it can take a little education to teach them how to pick up the blocks with the wagon. The wagon must be pushed, and only from one side in order for blocks to be sucked up by the spinning wheel. My son figured it out after being shown a few times, but a younger child might not quite get the concept. Thank you so much to Academics’ Choice for providing this complimentary toy for my unbiased review-I have a feeling this one is going to be a favorite toy for quite a while.